An exploration corner set up with all things possibly measurable is sure to bring about excitement, enthusiasm and the desired response in terms of units of measurement. Devices used for measuring, such as dals and pulses, calendars and clocks, cheese and butter packs, money and thermometers, juice cans and medicine cups for measurement, crisps and chocolates, speedometer, inch tapes, and yardsticks were put on a table and the students came in groups to sort these items. As always the variety of sorting in the grade 3 class was vast. While one group sorted based on the units mentioned on the packets or used to measure them, another group sorted based on the devices used for measuring them. When a third group came up with units that were used by various helpers and for occupations in our daily life, it brought our next task into place. Where in our daily lives are we required to measure things or check how much they weigh? This key question generated several answers and worked as an effective provocation. The students came up with masons, chefs, tailors, drivers, interior decorators, artists and milkmen – all of whom need to measure items and track the measurements. Students were also of the opinion that things could go drastically wrong if measurements were not taken into consideration while building houses, designing clothes, buying vegetables and so on. For the inquiry task, three differentiated groups assumed the roles of tailors, builders and decorators. They were to choose their devices for measurement from a variety of standard and non-standard tools, and to support their choices with a reason. The builder’s task was to design a doll’s house, based on the size of a doll provided (a standard sized Barbie). They were to ensure that the doll fits into the house as she sits, stands or lies down. The group picked their measuring devices: a measuring tape and a ruler. One of the group members said “Since we have to keep matching our measurements to the height of the doll in sitting and standing position, we need a standard tool to ensure correct measurements else the doll would not fit and we might have to rework.” The group figured that they had to keep an extra dimension in mind other than just the length and the breadth. They chose thermocol for the base and cardboard pieces to create pillars for the roof to stand on. 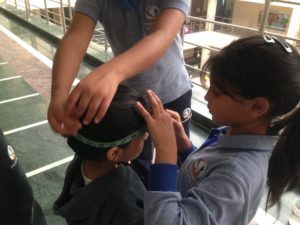 The tailors were to create a headband, two wristbands and a waistband for a member of the group to wear on an upcoming event in school. They only wanted to pick ribbons as a tool for measuring since they just wanted to put it against the body part to check. As quoted by one of the students in the group “We will straight away put up the ribbon to the wrist of the girl and make a mark where we want to cut and then decorate it.” However, when they made an exact measurement of the wrist and sealed it, they faced a major issue. One group member then said “It would not go through the hand as the palm is broader than the wrist.” This brought forth the importance and advantage of using a standard tool to measure. A student was heard saying ‘Even if we need a click button or a hook on the band, we still need some extra centimeters for the button’s place.” Their reflections at this point clearly brought forth higher order thinking and communicating skills. The decorator’s task was to create 4 coasters for a student table. As they discussed, one of them said “Since a square has all sides equal and is easy to create, we can create four square coasters of about 5-6 cm each side, it can hold a glass or a cup easily.” They wrote down the process and used the correct units to state the dimensions of their creations. These projects clearly brought about the use and need for measurement in our daily lives. Each job required some kind of measurement. The students became aware of the kind of problems people in the past might have faced using non-standard tools of measurement: “I wonder how people used to get correct measurements using their palms or a foot step as each ones’ measures different and they would have fought during group work.” The students carefully chose the measurement unit they wanted for their creations, they checked and cross-checked the dimensions as they created thereby getting the relevance of standard and non-standard units as a medium of estimation. What began with an exploration corner filled with items from daily use, ended with a realization on How the world works and using units and measurements an infinite number of times within a single day in many different occupations. 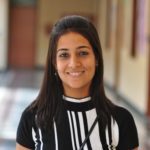 Megha Arora has been teaching in the PYP for 6 years and she is loving every bit of it. Learning at her school has no bounds as the students keep adding into their plans and taking it into new directions each day. She keeps looking forward to more and more learning each day from the students. She enjoys reading and listening to music while spending time with her family. Wonderful ideas Megha! it was worth reading. i will be starting this theme soon with my class and will your ideas have helped me to reflect back on my planning. Thanks Saadia! That’s truly motivating! Glad if these ideas will be of help- the reason we’re all here. Do share how it all went. It is a good Idea Megha, I have also used something similar with my grade 7 students. However, it was linked with ratios and proportions. The students were checking for the mathematical connections that exists within the length of the human body. My students were very engaged and got some ratios that I have never ever thought of as well. Hi Nisreen! Am sure of what a hit it would have been ratio, proportions and the himan body! Math into real life brings such AHA moments in the class and leave us trying more and more! Thanks for leaving a response here. Let’s stay connected.